Well, we can see that Matt Cain is about ready for the season. Maybe the Giants ought to thinking about signing this guy past this season. Just a thought. Cain sailed through five innings against the Reds, giving up no runs, four hits, no walks and fanning five. Cain is on schedule to start Thursday against the Rangers in his final spring start in the desert. Then, he should get the call on April 3 against the A’s in Oakland. That would align him perfectly to throw in Game No. 3 of the regular season on April 8 at Arizona. OF Gregor Blanco showed a rare boost of power, belting a home run in the second inning. He finished 1 for 5. His spring average has been slowly dipping in the past week down to .373. But it doesn’t matter much. His speed and glove will keep him on the roster, two things that don’t go into a slump. 1B Brandon Belt keeps doing his thang. He went 3 for 4 with a walk and a double. He’s hitting .380. Although Bruce Bochy still says the decision on whether to keep Belt on roster will go down to the wire, we can’t see how he doesn’t break camp with the club. OF Nate Schierholtz went 2 for 3 with a walk, as he tries to get things together as talk begins to circulate that his RF job is jeopardy (possibly to Belt, who would actually play LF with Melky Cabrera sliding to RF). Barry Zito gets the start as the Giants travel to play the White Sox at 1:05 p.m. The game will be aired on tape-delay at 9 p.m. on MLB Network. Don’t worry, Matt Cain. We still love you. When Cain left the bullpen Friday and walked onto the field at Scottsdale Stadium, he was greeted by huge roar from the Giants fans. Buster Posey returned to live action for the first time since May 25 of last year, catching Cain two innings and flying out to right in his lone at-bat in the Giants’ win over the Reds. Posey will get Saturday off, then return Sunday to catch four inning, according to manager Bruce Bochy. Well, that’s for sure. And it was also good to see Freddy Sanchez, too. Sanchez went 1 for 4 as the Giants designated hitter Friday in his first game since a shoulder injury ended his season last June. But the big test will come Monday, when he plays his first game at second base. Matt Cain pitched three scoreless innings, giving up three hits, no walks and striking out four. He has not allowed a run in five innings this spring. OF Melky Cabrera continues to rake. He went 2 for 3 with a two-run homer in the third inning. He’s hitting .588. Aubrey Huff made his first spring start in left field. He went 0 for 3 and is hitting .214 this spring. Meanwhile, Brandon Belt came off the bench and replaced Nate Schierholtz in right field. He went 2 for 2 with a double and an eighth-inning home run. He’s hitting .389. The Giants play split-squad games on Saturday. Barry Zito will start at Scottsdale against the Brewers, where he won’t have Prince Fielder to throw at anymore. Right-hander Shane Loux gets the start in Tempe against the Angels. And the hits just keeping on coming. Fortunately, so do the walk-off wins. Just as there appeared to be a little bit of light at the end of the injury tunnel, things got dark again when Freddy Sanchez left Friday’s game with a dislocated shoulder. The injury didn’t keep the Giants from getting their ninth walk-off win of the season on Nate Schierholtz’s game-winning single with the bases loaded in the bottom of the ninth, giving the Giants a 3-2 win over the Cincinnati Reds. But the excitement of the win was sobered some by the injury to Sanchez. Sanchez hurt his shoulder while making a diving stop of a groundball up the middle. He left the game in clear pain and was later taken to the hospital for treatment, after Giants trainers popped the shoulder back in place. Now, we wait for an MRI on Saturday to determine the severity of the injury. If accurate, the initial diagnosis for a dislocated shoulder is better than a separated shoulder. A separated shoulder involves a tear of the ligament that holds the shoulder in place. It would require a six-week minimum of recovery time, and likely would require surgery. With a dislocated shoulder, you’re looking at a recovery time of 3 to 12 weeks, depending on the severity. In the meantime, the Giants have to consider their next roster move, assuming Sanchez is headed to the DL. Infielders Mike Fontenot and Pablo Sandoval are on a rehab assignment with Triple-A Fresno. Both were expected to rejoin the Giants on Tuesday, and Giants manager Bruce Bochy did not expect either to return any sooner. Fontenot, in fact, may have suffered a setback with his groin injury on Friday. The first option is to do nothing and wait for Sandoval to rejoin the team on Tuesday in Arizona. With the Giants playing an afternoon game Saturday and with Fresno playing in Salt Lake City, there’s little chance of getting a replacement player in town ready to play Saturday. So we’re really only talking about playing shorthanded one more game on Sunday. This is the most likely option. Sandoval would then take over a third base on his return, with Burriss taking over at second base until Fontenot returns. We could even see Miguel Tejada at second base, particularly if he continues his recent hot streak. Fontenot’s return from the DL likely would result in Connor Gillaspie returning to Triple-A. But there’s another option. On Friday, Bochy mentioned that the Giants have not discounted the possibility of Sandoval playing catcher on occassion — saying that he would only make two starts a week at most under that scenario. That option would lead to Chris Stewart being sent back to Fresno. And the Giants could also consider calling up Brett Pill from Fresno. Pill has gotten off to a fast start at Triple-A, playing both 1B and 2B. At this point, the Giants have no sub for Aubrey Huff at first base, with Sandoval becoming the first backup option at 1B when he returns. But calling up Pill would require the Giants to make a move to open a spot on the 40-man roster. That could be created by sending Buster Posey to the 60-day DL. Interesting to see which way the Giants go. It’s only March 10. It’s only March 10. It’s only March 10. But on March 10, Madison Bumgarner added another outstanding pitching performance to a spring that has been full of outstanding pitching for the Giants. Bumgarner limited the Cincinnati Reds to one hit in four shutout innings, striking out six in a 7-0 win for the Giants. 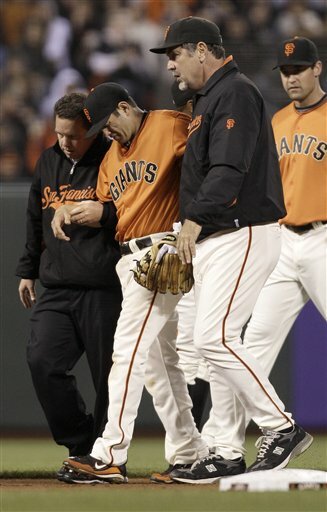 “You can’t ask mcuh more than what we saw today,” manager Bruce Bochy told the San Jose Mercury News. Thursday’s outing added to an impressive spring of pitching by the Giants. The Giants’ team ERA of 2.80 is the lowest in the majors during spring training. So that’s impressive. But of the next 10 best team ERAs this spring are being thrown in Florida. The next best team ERA from a team training in Arizona, where the air is lighter and livelier, belongs to the Dodgers at 3.98. And if you just look at the starting pitchers, it gets even better for the Giants. The ERA from the pitchers who started spring training games for the Giants is 1.79. If you take Tim Lincecum’s first start of the spring, in which he gave up three teams in 1 2/3 IP, the starters’ ERA is 1.24. Add to that the news that Matt Cain reported no issues with his elbow while throwing three innings of simulated game Thursday. ANDRES TORRES: Torres went 1 for 3 with a two-ru home run in the third inning. FREDDY SANCHEZ: Sanchez was 1 for 2 with a home run and a walk. CODY ROSS: Ross was 1 for 3 and hit the third home run in the third inning for the Giants. PABLO SANDOVAL: The Panda was 1 for 3 with a double. PAT BURRELL: The Bat was 2 for 2 with a double and a walk. He’s hitting .250 now for the spring after a slow start. SANTIAGO CASILLA and SERGIO ROMO: Both threw scoreless innings Thursday. Both have spring ERAs of 0.00. Andrew Baggarly of the San Jose Mercury News caught up with Edgar Renteria on Sunday, and the World Series MVP soundly as if he’s moved on from the acrimony of offseason contract negotiations with the Giants. And Giants should as well. But MoreSplashHits is still stuck on remarks Renteria made during these negotiations — when he called the Giants’ $1 million offer “disrespectful” — and reiterated on Sunday. Oh, we’ll then that’s OK, right? So … then .. it WAS about the money. It was entirely about the money … unless you sign for less — not more. Maybe MoreSplashHits has a different perspective about money than Renteria does. But we just have a hard time trying to figure out how a guy who has averaged about $9 million a year over the past seven years can say no to $1 million but yes to $2 million. That’s like someone who has been making $270,000 a year for seven years losing his job. Then saying “no way” to a $30K-job, but yes to a $60K job. We just don’t get it. But Edgar has his reasons, we’re sure. And MoreSplashHits is not upset that Renteria is gone. We figured he’d be gone, even after his great postseason. We were frankly surprised that the Giants made that $1 million offer, especially after signing Miguel Tejada and tendering a deal to Mike Fontenot. We couldn’t figure out how Renteria was going to figure into the mix. As it is, the Giants have 14 players in camp battling for 13 roster spots. How were they going to make room for Renteria? Renteria says he holds no bad feelings toward the Giants. And Giants fans should hold any ill will against Renteria. Renteria is looking forward to getting his World Series ring when the Reds visit San Francisco on June 8, and we hope he gets a rousing ovation at AT&T Park. If Giants fans heard that, they’d be just fine. So before he opens his mouth again on the topic of the offseason negotiations, Renteria should call MoreSplashHits. We’d offer him with a little public relations help. And we’d gladly work for anybody for $1 million a year. So long, Edgar Renteria, and thanks for the memories. ESPN Chicago is reporting that the 2010 World Series MVP will sign a one-year deal that could be worth as much as $3 million with incentives to serve as a backup infielder for the Cincinnati Reds. Of course, it was never about respect. It was about the going rate for an aging backup infielder these days, and it was about what the Giants had to offer. We don’t know the specifics of Renteria’s deal in Cincinnati. It’s probably at $1 million to $1.5 million base, with incentives that could allow the deal to grow to $3 million. The Reds will use Renteria to backup starting SS Paul Janish. Without Renteria on the Giants’ postseason roster, it’s difficult to say what might have happened last postseason, So thanks, Edgar, for that. But here’s another point: If the Giants didn’t put Renteria on the postseason roster — and there was strong consideration of that you may recall — there’s no way Renteria gets this deal. Without his strong postseason, Renteria would be signing a minor-league deal this offseason, or he would have retired.